Have you wondered why left-handed gardeners have difficulty using “regular” pruners? It’s because of the way the thumb and index finger have to push together to make the cut. It’s hard to control it for detailed work plus incorrect pruners often cause bruises and painful calluses to form. 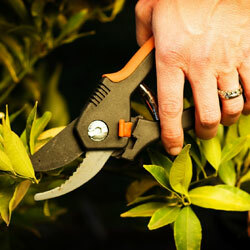 Fortunately, there is a solution – pruners specially designed for left-handed use. The correct pruners, with the left blade on top, allow the leftie to see what they’re cutting and enjoy pruning. Come on in to check out which of these wonder-tools fits the best. Felco hand tools originated more than 70 years ago when Felix Flisch patented his first hand pruner, the Felco 1. The company’s three core values, ergonomics, interchangeability and durability, haven’t changed and even today, all their products incorporate these values. We carry two left-handed styles of Felco pruners. Felco 9: This is the left-handed version of Felco 8, one of the most popular hand pruners ever. Recommended for up to 1″ cutting capacity, these bypass pruners have forged aluminum handles and hardened steel blades with a screw-mounted anvil blade. They include a lifetime guarantee. The efficient design includes a blade with a wire-cutting notch and a sap groove. The blades have removable dowel pins to allow easy maintenance and replacement. The micrometric adjustment system, using the included adjustment key, promises precision cuts and maximized user comfort. Felco 10: This bypass pruner is the top of the line left-handed version of the Felco 7. Designed for the professional gardener (but enjoyed by all), this pruner requires 30 percent less effort, thereby reducing hand fatigue, tendonitis and carpal tunnel syndrome with its unique rotating handle. The narrow, pointed blade design facilitates close-in pruning. Like the Felco 9, an adjustment key is also included. Also recommended for 1″ diameter cuts. Replacement parts are available for both styles along with holsters and blade sharpeners. This company, established in 1862, produces very fine gardening tools in addition to their industrial lineup. Although they look a little different, the workmanship and ergonomic design make them among the favorite of garden tools. This company uses the term “Secateurs” as hand pruners and designates the levels as professional or expert. PX-M2-L: This is a left-handed version of the popular PX-M2 bypass model. The composite materials in the handle with an upper section of soft rubber act as a shock absorber. The ergonomic styling and vertical and lateral inclinations of the cutting head allow the wrist to remain straight when cutting. This reduces fatigue and increases comfort and performance. All parts are replaceable. PXR-M2-L: This pruner is the left-handed version of the heavier bypass PXR model designed for frequent professional use. Home gardeners also love them! A rotating handle increases performance and comfort. All parts are replaceable. PG-03-L: This tool is the left-handed version of the home gardener (expert) hand pruner. This model is available in two hand sizes, small and large, and in two pruning widths for 1/2″ or 3/4″ cuts. Fiberglass reinforces the plastic handles and Xylan® coats the blades to reduce friction and protect from rust. As a convenience, it has a one-hand locking mechanism. Holsters and blade sharpeners are also available. The Corona BP6340 has aluminum handles and hook with replaceable blades and springs. The steel blades of high carbon steel and the ergonomically angled head result in close, clean and healthier cuts. With less stress to the wrist, it easily cuts up to 1″ branches. The Gardener’s Friend Ratchet Hand Pruners are designed for gardeners with small hands, or hands weakened by arthritis, carpal tunnel syndrome or tendonitis. The unique ratcheting action easily cuts branches to 1″ thick with less hand strain. Of course, we have an excellent selection of other specialized hand pruners in our tool department. Whether you are buying for a child, a delicate hand or a large-handed gardener, we have the proper sized tools to reduce strain and make gardening easier and more enjoyable for all.